Getting kids to work together collaboratively in your homeschool group (or even just amongst siblings!) is a great way to teach team work. I have been pulling together some great art project ideas that would work well in a group of children (or adults!). I have four different types of ideas to share - all of which can be adapted to different group sizes and ages. Some of them need a bit more preparation than others - but I have tried to keep them doable at home. The perfect group art projects for homeschooling! Why not try painting a 'master' painting together? 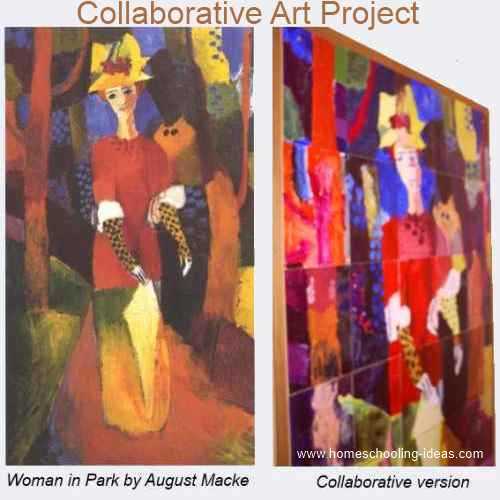 The idea here is to choose a famous painting, print it and divide it into square grids. You can make quite large grids if there are not many participants - or allow for each person to paint more than one section. Cut out the grids into separate pieces. Each child gets 1 grid image to copy - and a blank piece of paper or canvas. They then need to copy their individual image as best they can, scaling it up onto their canvas. 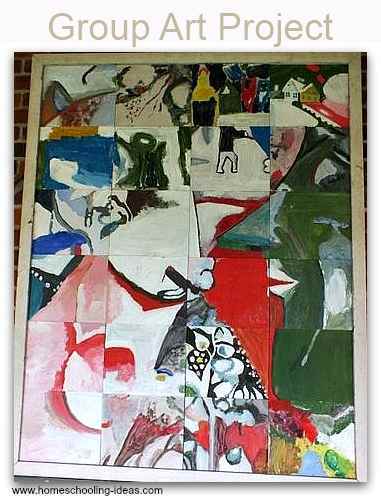 When all the sections have been painted, then simple assemble the picture back as a whole. They may not all match up exactly - but that rustic feel usually still produces a beautiful painting. With young children it may be easier for them if you produce sheets with the drawing already printed for them to color. If you can find a black and white coloring page of your chosen artist's painting, then you could use Blockposters to enlarge and print it. Or for a small charge, this site has lots of downloadable murals that would make this easy-peasy! 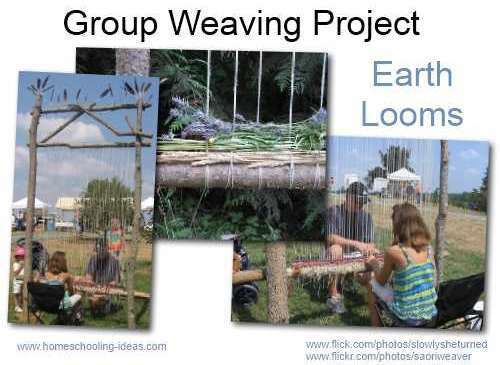 An Earth Loom is a large wooden loom made from natural resources. You could make this as large as you had space for - and invite people to weave sections with grasses and flowers - or yarn and fabric. They look beautiful in a garden and can be woven with different materials to show the passing of the seasons - a bit like my Seasons Tree Project. You can find out more about them at EarthLoom.Org. Mud Art projects are messy but beautiful! 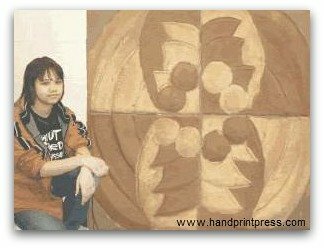 Artist Kiko Denzer has overseen many group art murals made from mud and produced a wonderful book called Dig Your Hands in the Dirt. Kiko kindly shared one of his projects with me, so now you can make your own natural clay art tile. Why not make several and combine them into a large artwork. This would make an unusual and beautiful project for your group. This is a fun art project that would work well for groups as well as individuals. Post-It note art! 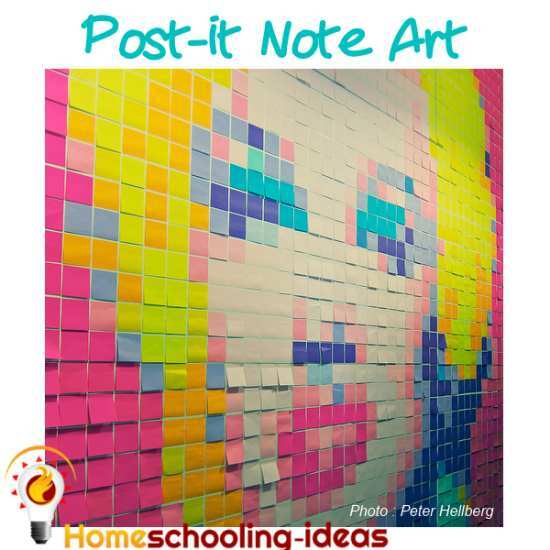 Use post-it notes to create an artwork display. They look great on walls or windows. Post it notes work great for making grid type art. You could work together on one large display - or let everyone design their own using graph paper - and have a series of smaller installations. Post it notes make a great temporary display because they won't damage the walls - so perfect for lots of venues. There is a great description of a teen project using this idea on the Teen Librarian site. And lots of inspiration here. For more ideas of 'non-permanent graffiti' check out my page on yarn bombing. I hope these ideas or group art projects get you started on some collaborative artwork of your own!